Last year I had the privilege to be a technical reviewer of one of the best books about resolving performance problems in Oracle database - "Troubleshooting Oracle Performance" written by my colleague from OakTable.net, Swiss Italian Christian Antognini. He is living in Bellinzona, Ticino Switzerland, only about 10 minutes drive away from one of the most beautiful airports in the world, Locarno (LSZL). He was also a speaker at Slovenian Oracle Users Group (SIOUG) conference in 2007. I had the privilege to host him and his wife in our house. When I was in Zurich this year he invited me and my wife to visit him in Bellinzona. We departed from Divača to Portorož (LJPZ) where we cleared the customs formalities and then we proceeded to Locarno. 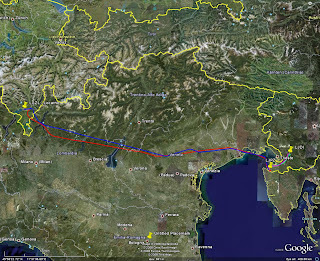 The route was: LJPZ - VICKY - GRADO - PORTOGRUARO - VIC VOR - BELLAGIO - LSZL. Before VIC VOR we were cleared to climb to 9500 feet what was enough to fly over some clouds and also over the mountains in the northern part of Italy. The last communication in Italy was with Milano information and then I switched to Lugano approach and finally after crossing the Swiss border to Locarno tower. I had to perform descending turns over Bellinzona in order to descend from 9500 feet to about 4000 feet what was low enough for final approach to Locarno, which is only 650 feet high. Locarno airport is mixture of civil and military airport. After securing the airplane we were welcomed by Cris and his wife Michell. After a light lunch at the airport restaurant we continued to Locarno, a very beautiful small town in the middle of up to 2000 m high mountains. I was so surprised because of mild climate. We saw many palms and oleanders. Next morning I took Chris for a short flight over Bellinzona. I gave him also the commands and he made the approach to Locarno airport. Of course, I was helping with the throttle and instructions. Meanwhile, his wife Michell was waiting at the airport together with my wife Lili and she was very nervous until we happily landed. The flight back to Portoroz was not so nice because the weather was not very nice and the forecast for the afternoon was even worse. Fortunately, the forecast was good enough for Slovenia. After crossing Swiss border we had to fly more to the south and only after clearing bad weather (raining) we could return to the planned route. Nearer to Slovenia the weather was becoming better so the rest of the flight was uneventful. We landed at Portorož (LJPZ) and after clearing the formalities we proceeded to Divača. Nice web page will use it again.